Wisconsin is hotbed of cool, under-the-radar attractions. If you’re not convinced, head to Milwaukee’s Harley Davidson Museum, where you can find vintage motorcycles, Army vehicles created for military purposes, and even snowmobiles and golf carts from back when Harley manufactured those machines. 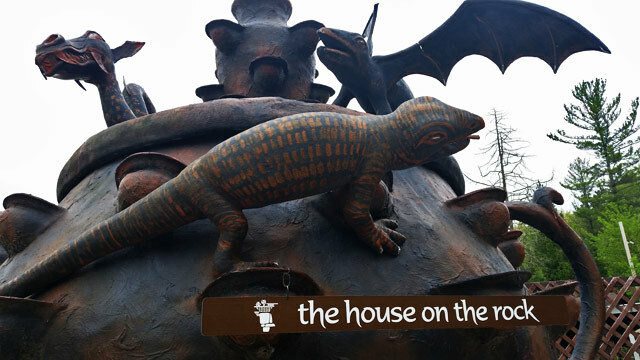 Then there’s the House on the Rock, the kooky house-turned-museum in Spring Green featuring dozens of rooms of toys, Rube Goldberg machines, instruments that play themselves, a giant sea creature, and the world’s largest indoor carousel. Another quirky attraction worth seeing is the “Bronze Fonz” statue. Located in downtown Milwaukee along the riverfront, the statue depicts Henry Winkler as the Fonz. The ’70s sitcom Happy Days was set in Milwaukee, and Winkler has personally visited the site, so it’s a fun piece of pop culture kitsch to check out. Finally, the Jelly Belly warehouse in Pleasant Prairie is a fun spot for kids and adults alike. You can sample dozens of flavors, from the classics like orange and cherry to weird new flavors like cantaloupe and buttered popcorn. If you’re coming to visit these attractions and need a place to stay in Wisconsin, these five properties are a good start when you’re starting your hotel search. Milwaukee is a city in the middle of a period of revitalization, and the Iron Horse Hotel personifies that rebirth. Built in 1907, the Iron Horse started out as a warehouse for a bedding company. Today, it’s an upscale hotel with 100 rooms featuring loft ceilings, large windows, and exposed brick walls. Good news for Harley Davidson Museum visitors: The Iron Horse offers motorcycle parking for its guests. As old as the Iron Horse Hotel is, that property seems brand spankin’ new compared to the Pfister Hotel, which opened back in 1893. Situated in Milwaukee’s financial district, three blocks from Lake Michigan, the Pfister boasts a spa, a salon, an indoor pool, and a lounge area – plus more than 300 spacious rooms and suites. The Country Springs Hotel, located west of Milwaukee in the small city of Pewaukee, is a good value with rooms starting at less than $100 and free wifi, public computers, and fitness center. Families will love the on-site Springs Water Park, while singles can enjoy the Wet Your Whistle Saloon, which serves adult beverages of all kinds. The town of Wisconsin Dells bills itself as “the waterpark capital of the world.” One of the city’s many massive waterparks is located right on the grounds of the Chula Vista Resort, and every overnight guest gets a free park pass. In terms of lodging, Chula Vista has guest rooms, suites, condos, and even a chalet to choose from. Another Wisconsin Dells property, the Great Wolf Lodge aims to provide touches of the forest in every room, including wooden bed frames and tree-themed artwork and décor. When you leave your guest room or fireplace suite, head to the waterpark, the Elements Spa Salon, or the Lodge Wood Fired Grill restaurant, all of which are found on-site.